Successfully Added Full HD 1080P Game Camera - 12MP, 6 Months Standby, 2 Inch Screen, Speaker + Mic, PIR, 23M Night Vision to your Shopping Cart. With 12 MP shooting there's very little this trail camera can't do. Pictures will be vibrant with good color depth and for saving on storage space there is also 8, 5 and 2MP options. 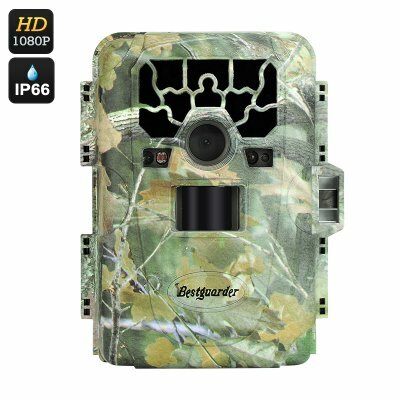 When it comes to video this hunting camera can shoot at 1080P so your wildlife footage will come out looking like a feature film with great quality that can be enjoyed when played back on computer monitor or la3rge screen TV. With programmable trigger intervals, number of shots and video clip length from 5 to 90 seconds your can capture a great insight into the comings and goings of all the local wildlife. A wide angles PIR sensor and seriously swift trigger time of under a second means that you won't miss any of the action and thanks to the cameras 36 IR LEDs and night vision you can be sure to capture all events night and day. If you have multiple cameras scouting a large hunting ground it can be hard to recall which footage is from each location, but with image and video overlays you can mark the location, barometric pressure and date as well as time on each shot. so not only can you see which animals inhabit an area but you will be able to build up a pattern of activity, knowing the frequency of their travels and stops by your camera. The camera can snap as many as 40000 shots when powered by 8 AA batteries (not included) or last in standby for as much as 6 months. With options to power the camera through solar panels or backup battery supplies you can easily extend this meaning the versatile trail camera can be set up to autonomously monitor an area for months on end. One of the beautiful features of this trail camera it that it can be lifted right out of its protective waterproof case so you can easily swap the batteries and memory cards without having to un-mount the whole camera, so its quick and easy to maintain a watchful eye over any given area. This high definition trail camera features a built in speaker and mic. so not only can you record the sounds of the animals that pass by but you can preload background sounds or animal noises to attract the animals your trying to film. With its IP66 case and operating from minus 30 to 60 degrees Celsius this game camera can work all year round and is your perfect partner for tracking every size animal so you'll know where all the wildlife is every season of the year. This Trail Camera comes with a 12 months warranty, brought to you by the leader in electronic devices as well as game and hunting cameras..